OF ALL THE SUCCESSORS of Alexander the Great, the family of Ptolemy, son of Lagos, was the most successful, ruling Egypt for nearly three centuries (305 – 30 BCE). Oddly enough, the story begins with a hijacking. When Alexander died in Babylon on 10 June 323 BCE, his corpse, embalmed by a team of Egyptian morticians, was placed in an elaborate mule cart for travel back to Macedon in northern Greece for burial with his ancestors. Ptolemy (born 367, died 283 BCE), one of Alexander’s boyhood companions and trusted bodyguards, seized the body and diverted it to Memphis, capital of Egypt, where he had been appointed satrap (governor). Moved to a splendid tomb in the newly founded city of Alexandria, Alexander’s body became a trophy and symbol of legitimacy for Ptolemy’s dynasty. 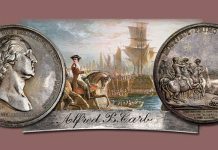 For centuries, this extensive and complex coinage has been a challenge for scholars and a delight for collectors. Even the epithets were sometimes repeated, so we get “Ptolemy VIII Euergetes II” (born c. 182 BCE, died 116) also known as Ptolemy VIII Physcon (“Fatty”). The queens and princesses of this prolific dynasty share just three names – there are at least seven numbered Cleopatras, four Berenikes and four Arsinoës. 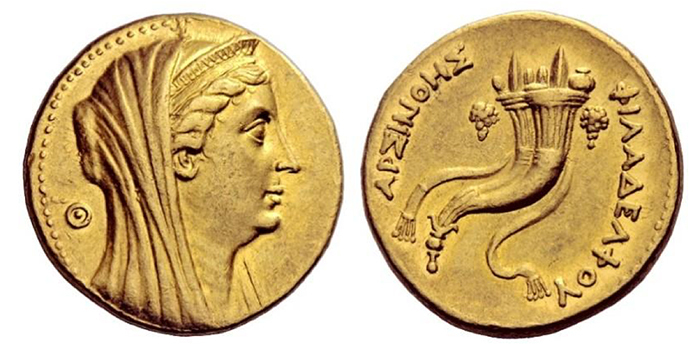 This is the first article of a three-part series that will examine the coins of the Ptolemies. The earliest coins of Ptolemy I followed the pattern of Alexander’s coinage, using the immense hoard of bullion captured from the defeated Persian empire. 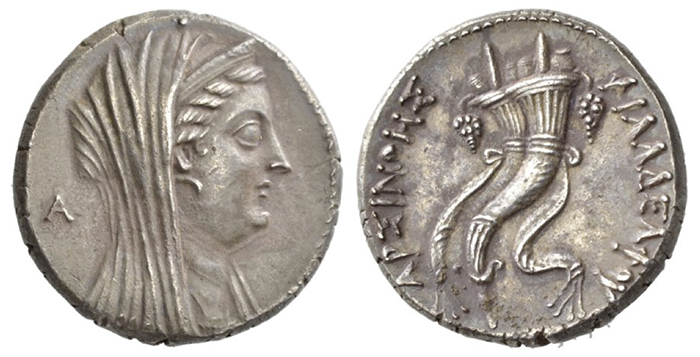 At an uncertain date (c. 316 – 312), Ptolemy issued a new type of silver tetradrachm bearing a portrait of the deified Alexander wearing an elephant head-dress (symbolizing his conquest of India). On the reverse, the goddess Athena, wearing an elaborately pleated chiton, advances holding spear and shield. The inscription Alexandreion Ptolemaiou can be interpreted either as “Alexander Coin of Ptolemy” or “Alexandria coin of Ptolemy”. Apparently, the other Successors didn’t approve of Ptolemy putting his own name on the coinage, and on the example shown it was deliberately erased from the reverse die. About 305 BCE, Ptolemy took the title of king (basileus in Greek) and boldly placed his own portrait on his coins. On the reverse of his gold staters (a coin about 7.2 grams that represented a month’s pay for a foot soldier), a male figure holding a thunderbolt (some sources say the god Zeus, others say the deified Alexander) rides a chariot drawn by four elephants. An example of this rare type realized $40,000 in a 2016 auction. With the fertility of the soil renewed each year by Nile floods, Egypt grew rich on export of grain that fed much of the Greek world. Gold mines in Nubia and the Eastern Desert fed a steady stream of wealth into Ptolemy’s capital. 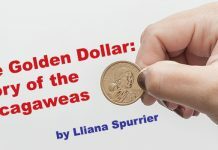 Some of this wealth took the form of high-denomination gold coins, convenient for trade in costly luxuries, or for paying the salaries of the elite. 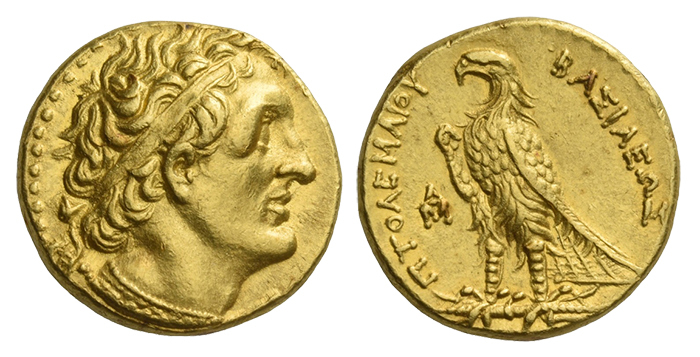 The spectacular gold pentadrachm, or trichryson, of almost 18 grams bears Ptolemy’s heavy-jawed image, and an eagle grasping a thunderbolt in its talons–a design that would be endlessly repeated on the coinage of the dynasty for over two centuries. A craftsman known only as the “Delta Master” cut some of the most artistic dies of Ptolemy’s coinage. He signed his work with a tiny Greek letter (Δ) hidden in a curl of hair behind the ear on the portrait. An example of this type realized $550 in a 2001 auction. Ptolemy had three official wives and numerous liaisons, fathering at least 11 children. In 289 BCE he appointed his son, Ptolemy II as co-ruler. He died in 283 or 282, aged 84, the only one of Alexander’s Successors to die peacefully in his own bed. Ptolemy II, unlike his father, was not a military leader, nor a charismatic king. 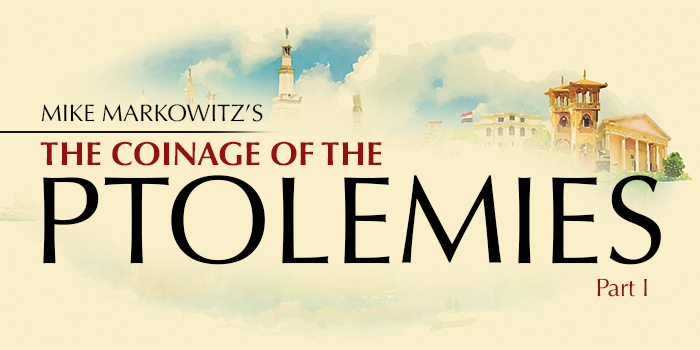 A keen administrator, Ptolemy II enriched himself by commercial ventures and heavier taxes, albeit much of his revenue went to support his soldiers, courtiers, poets, priests and foreign allies. Ptolemy II was born in 308 BCE on the Aegean island of Cos, where his parents were engaged in the complex struggle against the other Successors of Alexander. He is known by the epithet Philadelphus (“sibling-loving”) because he married his full sister, Arsinoë II (ar-SIN-oh-ee) aged 43, in 273 BCE. Philadelphus continued the issue of his father’s high-quality silver coinage, with the same design, at a variety of mints in Phoenicia, Palestine, and Cyprus, as well as Alexandria. According to legend, for his vast Alexandria library, Philadelphus commissioned the first Greek translation of the Hebrew Bible. His most memorable achievement was the construction of Alexandria’s great lighthouse, the Pharos, one of the Seven Wonders of the ancient world. Standing over 100 meters (330 feet) tall, the granite and limestone tower took 12 years to build, at a cost of 800 talents. Although repeatedly damaged by earthquakes, parts of it stood until 1480 CE and it appears on a number of Roman coins struck at Alexandria under the empire. After the death of Arsinoë II, she was declared a goddess and commemorated on large (over 35 grams) silver decadrachms and gold octodrachms. 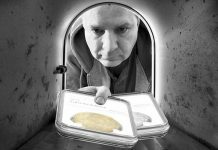 The veiled head is an artistic convention for depicting deceased subjects. 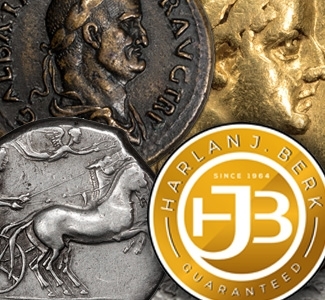 The gold octodrachm of Arsinoë II is #74 on Harlan Berk’s list of the 100 Greatest Ancient Coins. Figure 8: Ptolemy II Philadelphus. Bronze Drachm. Figure 9: Ptolemy II Philadelphos. Mnaeion, Gold Octodrachm. Ptolemy II celebrated his ancestors on the obverse of a magnificent gold octodrachm where the joined portraits of Ptolemy I and Berenike I bear the simple inscription Theon (“Gods”). The exaggerated eyes of these portraits emphasize their divinity. On the reverse, the joined portraits of Ptolemy II and his sister-wife are inscribed Adelphon (“siblings”). This gold “dynastic” octodrachm of Ptolemy II is #84 on Berk’s list of the 100 Greatest Ancient Coins, and it continued to be issued under Ptolemy III. 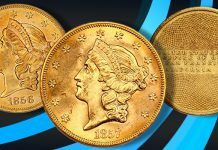 Most surviving examples are in nearly uncirculated condition and sell at auction for $8,500 – $12,500 USD. With control over the rich copper mines of Cyprus, Philadelphus issued an extensive bronze coinage in a wide range of denominations. Ptolemaic bronzes typically have a small central pit or dimple on each side, a feature that has been debated by numismatists for centuries. The current consensus is that the blanks were cast in molds, and then chucked on a lathe to smooth and round the edges. The dimples were pressed into the metal by the pins of the lathe. 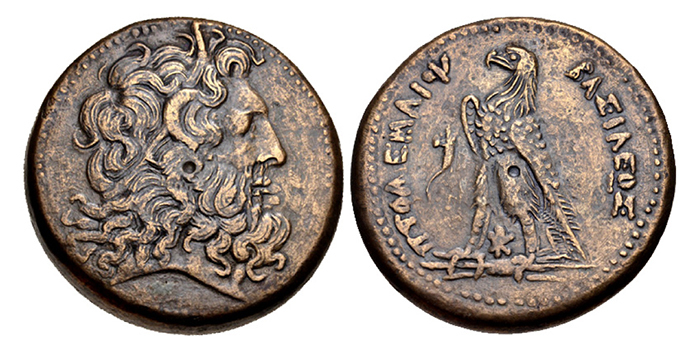 The obverse bears the horned and bearded head of Zeus-Ammon, a god who fuses attributes of Greek and Egyptian divinities. The reverse bears a pair of eagles, which would become a standard mark of the denomination for many of the largest Ptolemaic bronzes. Ptolemy III is known by the epithet Euergetes (“Benefactor”). Under his rule (246 – 222) Egypt grew powerful and prosperous. He adopted the cornucopia (“horn of plenty”) as his personal emblem, and it appears on many of his coins. For the Library of Alexandria, Euergetes borrowed the official edition of the plays of Sophocles, Aeschylus, and Euripides, and to retain the originals he forfeited to Athens an enormous 15-talent deposit (he sent back copies). He appointed the brilliant mathematician Eratosthenes of Cyrene (276-194 BCE) as director of the Library and tutor to his son, the future Ptolemy IV. Ptolemy III’s chubby face did not appear on his coinage during his lifetime but was used by his son, Ptolemy IV on a commemorative octodrachm. The deified father wears the spiked crown of the sun god, and holds a trident, symbolizing command of the sea thanks to his powerful navy. He married his cousin, Berenike II of Cyrene, in 244. A formidable woman, she ruled Egypt skillfully while Euergetes was away on a campaign against the Seleucid empire. 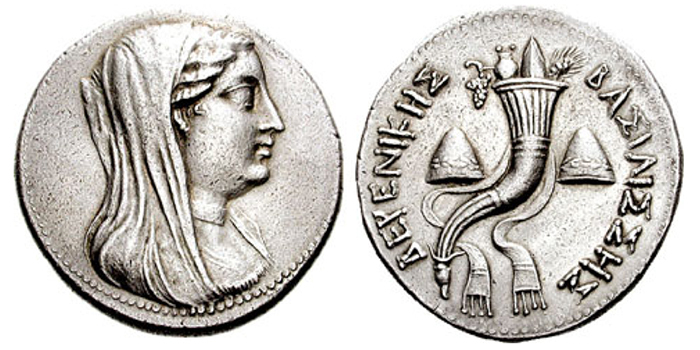 One of the largest silver coins of antiquity was issued in honor of yet another Berenike, Ptolemy’s sister, who married the Seleucid ruler Antiochus II and was murdered in a palace coup; the silver pentakaidecadrachm weighing just over 52 grams (valued at 15 drachmai sometimes described as a dodecadrachm or 20-drachma piece, because of uncertainty over the weight standard). 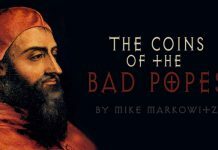 This coin is #58 on Berk’s list of the 100 Greatest Ancient Coins. 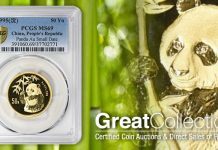 Until recently these were considered very rare, commanding prices up to $200,000, but recent finds (some evidently from sea salvage) have dropped the price as low as $14,000. Of about 50 examples known, many have cracks from striking, perhaps because the blanks were insufficiently heat-treated. Bronze coinage in a range of denominations became increasingly important in the Egyptian economy during this reign. With a high tin content, these high-quality bronzes often survive in beautiful condition. 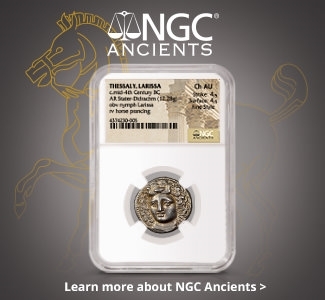 A piece of about 68 grams was probably valued equivalently to a silver drachma (although there was a 2.5% service charge for converting bulky bronze coin into the scarcer and more convenient silver.) A high-grade example of this type brought $450 in a recent auction. Many beginning collectors are surprised to learn that there is virtually no Egyptian coinage before the time of the Ptolemies. The traditional temple-based economy of ancient Egypt functioned smoothly on a barter and commodity basis, and imported Greek silver sufficed for centuries for foreign trade. The Ptolemies introduced a “modern” monetized economy, right down to the village level and hoards of Ptolemaic coins have been found across the Mediterranean world. 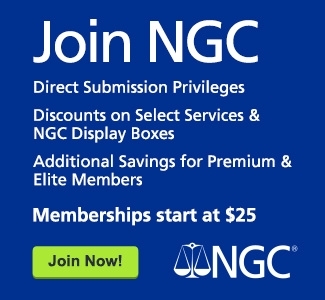 Examples in all price ranges appear frequently on the market. For over a century the standard reference was the monumental four-volume catalog of Ioannis Svoronos (Athens, 1904-1908) in Greek. German and English translations exist, and the text and superb plates are online, thanks to the American dealer Edward J. Waddell. Furthermore, in 2018, the American Numismatic Society published the first two volumes of a magnificent multi-year project, Coins of the Ptolemaic Empire, by eminent American numismatist Catharine C. Lorber, who has spent decades studying this material.